As most of you will already know, I changed my diet at the beginning of the New Year. It wasn't because it was cool or the trendy thing to do right now, it was for me and ultimately for the environment. I have now been eating a vegan, plant-based diet for the past four months and I have to admit, it was much easier to transition than expected. Although I have only changed what I have been eating so far, I hope to apply this attitude to my entire lifestyle with time. Growing up in a Greek family, I was raised on food. I know technically everyone is raised on food, but I honestly mean it. Food is at the forefront of any occasion and celebration and sometimes even determines the festivities too. With the Easter celebrations impending, I was starting to feel a little bit self-conscious about turning up to the family party with vegetables (although I assure you, it's not all I eat) and having relatives chew my ear off about why I wasn't eating the 'normal' food. 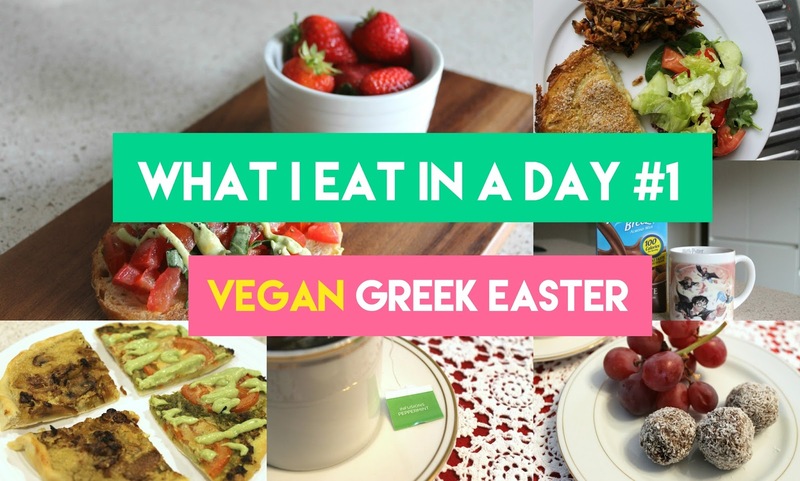 I then came up with the idea for this post to share with you what I ate for each meal and also share any recipes I have come across too. Now please, don't take this post the wrong way. By no means do I want to come across as 'preachy', I honestly just want to share some lovely foodporn with you! I started off the day prepping food for the day in the kitchen, so I needed something small and quick to eat. I had this leftover bruschetta from the night before in the fridge, (tomato, basil and avocado mayo) and a handful of fresh strawberries which smelt so delicious they were practically begging to be eaten. My family and I had lunch over at my Grandparent's house with some of my Aunties and Uncles and while they were having their meat and potatoes, I dug into this surprisingly delicious Nut Roast that I recreated after seeing it in one of Niomi Smart's videos. Accompanying the Nut Roast were these creamy yet light scalloped potatoes made from a base of cashews and almond milk and a nice helping of salad greens. I ended up going back for a second helping of those potatoes because they were just too damn good! I had originally intended to make a Raw Chocolate Tart dessert from a recipe I found online, but I ended up running out of time and decided to quickly whip up a batch of delicious Rumballs made Vegan using Condensed Coconut Milk. I also added a handful of grapes to my plate, accompanied by a peppermint tea. As the evening was cooling down even more, I craved a warm beverage and playing on the Easter celebrations a bit more, I warmed up a mug of chocolate Almond Milk! I have heard a lot about chocolate almond milk recently, but this was the first time I have ever tried it and I was more than impressed by the taste. Of course, my love for Harry Potter never sways, as you can see by my choice in mugs! I had an unexpected pizza craving for dinner so I quickly defrosted some dough and made two mini pizza bases with different variations. For one, I used the leftover cashew cream that I had from the scalloped potatoes earlier that day and used that as a base with caramelised onion and mushroom, and for the other I made a pesto base using sliced tomatoes and a drizzle of the leftover avocado mayo I had from the previous day. I had a little bit of both variations and wrapped up the rest to eat for lunch the next day. As you can tell, I really like to get the most out of my leftovers! Most of the dishes I come up with myself as I have really come to love to experiment in the kitchen so I usually don't follow a recipe, but if there is something here that you would like to see a recipe for, I would gladly make it happen! I personally enjoy reading (and watching) posts like this as they give me food inspiration and also, I'm just a nosey bugger! Let me know if you would also like to see more posts like this too. Everything looks delicious!! To be honest I've thought about becoming vegan for a while now, not because it's "trendy", but because of the environment as you say, but I just don't feel prepared to do so, so I've waited. I don't wanna do it for a week, I want a full commitment, that's why I prefer to wait until I feel prepared for it, but I'm glad to see you've done so! Great post, keep it up and eveything looks greeeat!! Thanks so much Brenda! That's amazing that you're looking to commit to a vegan lifestyle, I would definitely suggest watching Cowspiracy and Forks Over Knives if you're looking for a push in the right direction. I know both of these films helped me in my quest to pursue this lifestyle. Thank you so much Carmen! They were quite rich, but very delicious! Wow look at you! I love how creative you've gotten in these meals. I wish I could come up with something like that but I find myself needing a recipe to base something off first lol. Those potatoes sound utterly delish, cashew cream, yes please! Maybe I'll do a recipe for this soon! Viva Epernay | Festival Tickets Giveaway! That chocolate almond milk was absolutely delicious! Good on you for committing as a vegan, Anjelique, so much respect to you. I don't usually follow recipes either and whip up dishes just by estimation or gut feeling so I understand how hard it sometimes is when a friend ask for recipe. LOL! Thanks Shireen! I definitely used to be totally dependent on recipes too, but ever since I've started experimenting in the kitchen more I find I only need them for inspiration rather then the follow it! Everything looks amazing...especially that pizza! Cashew cream?! Genius! Thank you so much Kasie! You've put together some deliciously healthy recipe suggestions, and I love that you've revamped your diet for your own (and the environment's) benefit, not simply because it's cool to do so. Your healthier version of a pizza looks SO good!! I will definitely check out Kicki Yang, thanks for the tip! that post made my hungry ! Haha the food is quite delicious! This is such a fun post! The bruschetta looks amazing!